Mother Nature certainly did it right when she created this little crunchy yet buttery edible that comes packed with fiber. Nuts provide us with compounds such as carotenes, lutein cryptoxanthin and resveratrol (all poly-phenolic flavonoid antioxidants) that have been found to provide protection against heart disease, degenerative nerve disease, and cancers. Rich in omega-3 essential fatty acids, calories, vitamins and minerals like calcium, iron, and magnesium, zinc, manganese, potassium, fluoride and selenium, they also provide healthy levels of vitamin E that works to maintain the integrity of cell membrane of mucus membranes and skin protecting from harmful oxygen-free radicals. Offering an array of B-complex vitamins, nuts provide us with niacin thiamin, pantothenic acid, B-6, riboflavin and folates…all essential for optimum health. In the past nuts were relatively ignored or dismissed as just “fattening snacks” because of their high caloric density and fat content. But times have changed as people have grown smarter about nutrition and now nuts are enjoyed for their nutritional contribution to our health. Although they do contain a significant amount of fat, this fat is the monounsaturated type that actually discourages disease. The versatility and variety of nuts is another reason they are so popular. Pistachios, walnuts, almonds, cashews, peanuts, pecans, pine nuts and Brazil nuts are all great choices. You can eat them whole in their natural state or you can salt or sweeten them. Sprinkle over desserts or use as an ingredient in pancake batter, biscuits, muffins, cakes, breads and other sweets dishes. Put into a high speed blender, they make nutritional “nut butters.” Use nut butters in sandwiches or on top of bananas for a super healthy snack. Add them to your favorite pasta dish or sprinkle them on salads for an added nutrient boost. According to the Food and Drug Administration, enjoying 1 ½ ounces of nuts (approximately 1/3 cup) daily that includes a variety of hazelnuts, pecans, walnuts, almonds and peanuts can actually help reduce the incidence of heart disease. 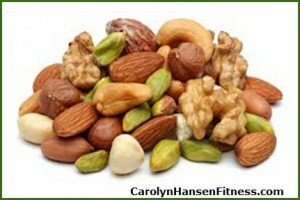 Another study done at Harvard with 83,000 women nurses aged 34-59 found that nuts are empowered to significantly lower the risk of developing type 2 diabetes. The result of this test showed that those who ate 1 oz. or more of nuts at least 5 times weekly were nearly 30% less apt to have diabetes than those who never ate nuts or ate less than that. Furthermore, studies reveal that people who eat nuts are no fatter than those who don’t. In fact, nut eaters are proven to lose weight and keep it off. Because of their high fat and protein content that help to keep us feeling full and satisfied, nuts help to control weight by keeping us from snacking too often on sweets and other carbohydrates. With so many choices readily available offering so much nutrition in such a small package, these super foods could and should be enjoyed regularly. If you are ready to take your traditional desserts and turn them into “life giving” desserts grab my “50 Desserts with Hidden Veggies. “ In it you will discover no bake, Paleo friendly, no sugar, gluten free healthy sweet treat and dessert recipes using a variety of nuts.